I have really been thinking about jumping on this bandwagon. I know it's trendy, but hey- I was hanging out with chickens a long time ago in LA in our first house when our neighbors let "brownie" the chicken walk all over the neighborhood. One day I came home to find my husband working at his desk with brownie sitting on top of it just haning out. It was a little random, but I swear those two had a serious connection. After that, Brownie was a regular visitor, until the unfortunate day when Brownie was eaten. Ever since then, I can randomly find my husband browsing through chicken coops and chickens online. I think Brownie made quite an impression on him and I might have to brace myself for the fact that I will have chicken in my yard someday soon. So I am going to let you in on all the research I've done about owning chickens! They provide food for your family that has almost a zero cabon footprint! It only has to travel from the coop to your plate. They eat pests in the yard- so they are like a natural bug zapper without the yucky flourecent light and zapping sound. Make sure to keep them dry or they'll get seriously cranky and who wants a cranky egg? Put a roof over their heads and give them about 2-3 feet per hen. 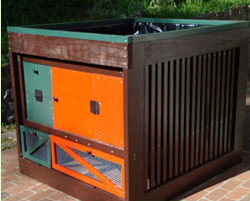 Make sure to keep them safe from predators such as; fox, raccoons, rats, skunks and mountian lions, mites and lice- you can do this by having a safe and secure coop. Pine Shavings are best to keep their floor clean and dry. Give them food and water- make sure the water is kept very clean, and treats such as table scraps are always appreciated. The City Chicken- this site lets you know about the laws in your area of keeping chickens. A lot of times you can keep chicken, but are not allowed to keep roosters for obvious reasons. There are also some great chicken pics there. Back Yard Chicken- everything you ever wanted to know about chickens and their owners is here. It is unbelievable how many people around the world want to talk all things chicken! 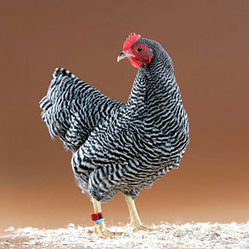 The Country Chicken- has some great ideas for maitinence and keeping the mites and lice under control. Extra Extraordinary Chickens by Stephen Green-Armytage. 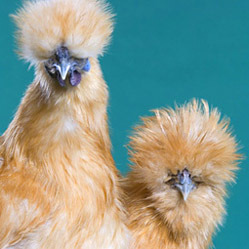 It has some great pictures of some kooky looking chickens. Great for inspiration. Hen and the Art of Chicken Maintinence: Funny and moving memiors of how one man lives with his chickens. 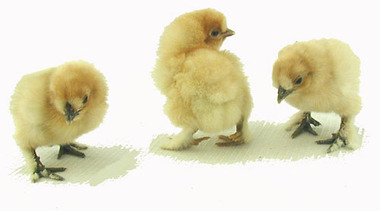 Choosing and Keeping Chickens: A practicle guide and great information on keeping chickens. 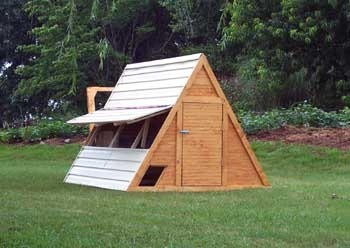 Greenroofchickencoop.com: This is the one. 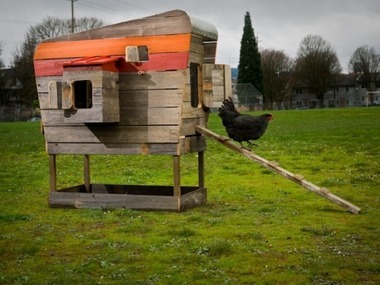 It doesn't get any cooler than this chicken coop with a green roof. You will be the talk of all things green! 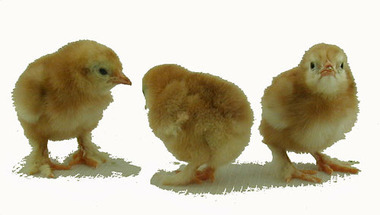 Mypetchicken.com: This site has great pictures, and a wide variety of all kinds of chickens. McMurrayHatchery.com: They have great specials and will actually pick out a grouping of chicks for you. Also a great place for accessories. Thanks for the list of resources. Our 13 fat hens rule the roost. We use a dog run attached to the back of the hen house for those days when it&#x27;s not safe for them to run free in the yard - chicken hawks, skunks and stray dogs are a danger here. I might add that having chickens in a confined area is the best way to eliminate problem weeds in no time. We don&#x27;t need herbicides with our girls running loose in the yard. Unless you are willing to lose that sculptured lawn, don&#x27;t buy chickens. I have a good friend who raises chickens in his backyard in the middle of West Palm Beach! Hysterical!!! We also had a neighbor with chickens, but this was apparently against city code (livestock). Before the chickens left, though, the rooster, Ricky, really loved to hang in our yard and roost on top of our boat. My husband bonded with Ricky. And before we relocated to S Florida, we had chickens on a 7-acre farmette up north...successfully until the fox got them all. My husband set out with the dog and the gun to handle the situation but couldn&#x27;t as the fox had a litter of the cutest little fuzzy things ever! Oh well!! guess it's called nature for a reason- poor chickens! Baby foxes are THE cutest though. Congrats to your friend in WPB! And good luck staying below the zoning radar. I know from experience that WPB code enforcement is a complaint-driven organization, so keep those hens quiet, confined and clean, and bribe the neighbors with eggs. I'm in nearby Palm Beach Shores but keep my 3-dozen chickens out in Loxahatchee. Our big predator is black snakes. They'll swallow eggs whole, two or three at a time, quite a sight. The new setup is a big shared nest box suspended at chest height by metal rods from the roof. So far the snakes haven't figured out how to get in. yikes- snakes freak me out, but that is a whole other ball game!!! Egghead, cool that you're in PBS. I'm close by...work in PBG and live in St. Lucie. Let me know if you're out and about to a plant sale or similar...I'll join you! Don't forget ducks.They lay wonderful eggs and are a great source of entertainment and insect eaters. I tried duck eggs this year - they were HUGE! We all enjoyed them too. Tasted 'egg-y-er.' Good!